Polka Dot Overload | Sewing, knitting & vintage projects, tips, tutorials and cartoons! : Chartreuse Cardigan Progress + Blue Ombré Overload Socks! Chartreuse Cardigan Progress + Blue Ombré Overload Socks! Rough as it's been around here lately—with no sewing going on to speak of—I've been stealing bits and odds and moments to knit, mostly on my subway commute. 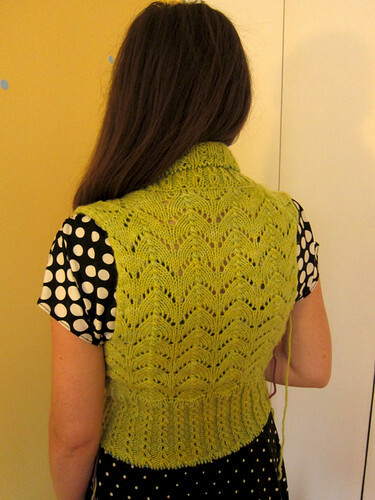 And somehow all those moments have finally added up to... most of my chartreuse organic merino Georgina cardigan! (full Ravelry details here). Here's the back (I'm so into the lace, maybe I should just walk backwards so people can admire it more directly). It looked SO teeny-tiny while I was knitting that many people asked if I was making another toddler sweater... so I'm REALLY glad it actually fits. So... the fit is great... the organic hand-dyed merino is soft as a cloud... the design is awesome... BUT... I may not actually have enough yarn left for full sleeves. 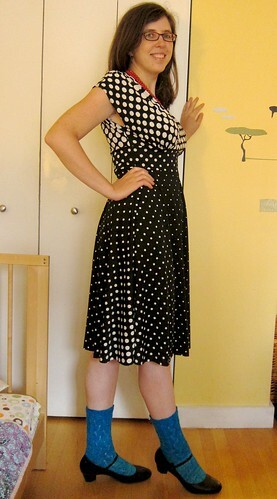 So—how do you all think this will look with cap sleeves? (There is no budget for an additional skein, though I WILL allow myself to buy proper buttons). Though honestly... you'll never actually catch me wearing socks with a dressy dress. I pretty much wear them with pants or SOMETIMES with casual skirts. I swear the gradation is much more obvious in real life! How are your fall knitting and sewing plans coming along? 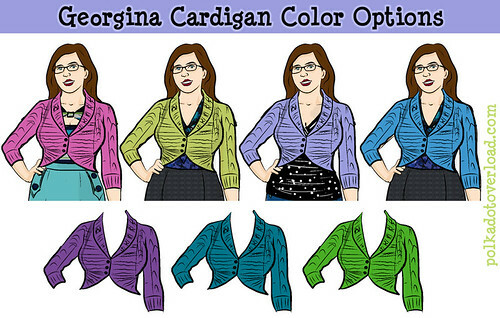 The cardigan is amazing. I really need something in that colour. I knew I did already, and you've just reinforced the certainty. That sweater is already looking so beautiful! Yay! I think cap sleeves would suit it just fine. It's light & lacy so shorter sleeves would be complementary. I also love those socks! I still haven't gotten around to tackling my own pair (sorry, I'm still scared of them haha) but I did just cast on my very first hat - with cables! Let's hope I can actually do them haha. 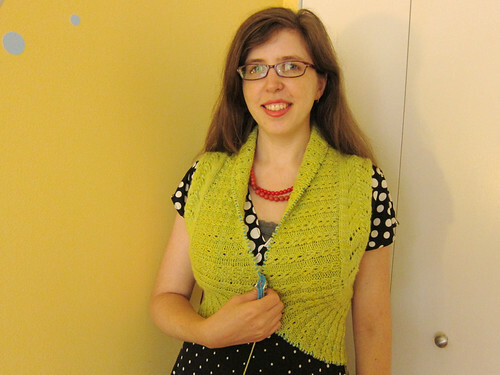 Your cardigan is gorgeous, the knitting, the color, the style, everything! I really, really want you to go back and get enough yarn for sleeves. Your sweater is amazing! I second Karin's thought about getting enough yarn for sleeves, but I do understand the need to stick with a budget. Cap sleeves would not at all detract from the beauty or style of the cardigan. I look forward to seeing the finished project. Lovely socks, also. Your knitting is really quite inspiring! I think it's just fine with short sleeves and would probably make it more wearable! Can't wait to see the finished product! Beautiful! That is gorgeous! I think the capsleeves will be fine. Your socks look so perfect! I'm in the same boat as you with projects - sewing has been a non-starter, but I'm making great progress on some to-be-blogged knit socks and I've got several more knitting projects in queue. Sigh. That cardigan looks great on you! I, however, would look dead in that color. OH, SWOON! To everything! Your lace work is so beautiful, precise... Wow! Yes to walking backwards! hehe. And those socks. I never get my second sock finished, I'm one of those types of knitters. Yours are so awesome! I like them with that dress, but I think I dig the socks/dressy shoes/dress look in general. That chartreuse sweater is going to be beautiful. I love the color. I thought about you the other day. We have a student with severe allergies who is transitioning in to kindergarten at my school. He's doing great and everyone is looking out for him. Just know that there will be so many people who will look out for your little one as she starts daycare/school. Hurrah for public transportation! You can't really knit while you're driving, although a friend of mine does at stoplights. Those blue socks are lovely! I'm so impressed that you finished all of that on your commute! Well done. Love the cardigan! It looks amazing! Your cardigan is such a stunning color - I think it would be perfect with cap sleeves, but I'm totally biased because I'm not to that knitting level yet and I think it looks perfect no matter what :) I start my next round of knitting classes next week (SQUEE knitting in the round) and eventually I will move onto making epic socks like you do :) Your pieces are so pretty!! I love all of the bright colors - they are just so cheerful!